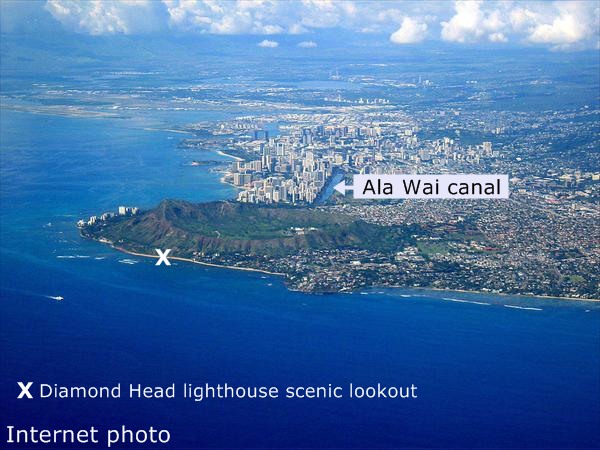 Meanwhile, back at the Diamond Head lighthouse scenic lookout. Navel gazing. Not literally with a magnifying glass over the inni or outi. But metaphorically speaking, as in, an expression of speech. I do have belly button, but I haven't looked at in years. Moving on, if you do maintain a Facebook page, be awares that a perspective employer may examine the contents therein to determine your job worthiness in their particular organization. In last week's LPGA tournament, Michelle Wie was penalized two strokes for grounding her iron after blasting her golf ball out of the water hazard. In her defense, Michelle claimed that she was off-balance from having to close her eyes in reaction to the splashing water, and grounded her iron or wedge to regain her balance, which is permitted under tournament rules. Irregardless, tournament officials ruled against her after reviewing the video tapes. However, the video tapes only showed Michelle from the front view. I believe that that from a side angle, it may have showed her tittering at the waist and who'd want to fall into the same pond with all the golf course ducks living in there. However, what was totally amazing is that while the tv live coverage followed Michelle and the tournament officials into the video booth and recorded the lively deliberations, it simultaneously preempted the trophy presentation to the winner of the tournament, whatever was her name. That's a testament to Michelle's star power. The LPGA is in the dumps as far as sponsers and Michelle remains their foremost marquee player to draw in a much larger tv audience. While watching the news of Apple's iPad (tablet computer) that goes on sale tomorrow, the reporter also mentioned that Apple sold over 50 million iPods in 2009. That's amazing. The priesthood is in the news again for their alledged role in the cover up of acts of sexual molestation partaken by their brethen. All I can say, is that priests have always been perverts. Definitely not all, but enough of them. Arguably, there's not a single priest who hasn't been molested himself by a priest in a superior position in a seminary as part of the education process. The solution is to cut their balls off, and if an individual then later decides to quit the order, he'd be entitled to a free transplant balls from a donor about to enter the priesthood. I've been seeing that in the news recently, about how potential employers are spending a lot of time looking through social networks for incriminating evidence on prospective employees. I hear they keep tabs on current employees that way too. My Facebook will always be private, with all updates set to private, and I won't be inviting my employers or even fellow employees to it. That's just asking for problems. Oh... and I'm already so tired of hearing about the iPad. I'd rather have a laptop, a traditional e-book reader with an e-ink screen that's easy on the eyes, and my iPhone. That's more than enough really. Brad- it might work out well if applicants rave about perspective employers whom are known to scrutinize applicants' Facebook pages. I've heard that the Ipad is not as easy on the eyes to read as the other dedicated options already out there. Nate- a 78. That's not the way to shoot a final round in an LPGA major. Ya. It seems to me that the iPad is designed for short reading sessions, like reading digital magazine subscriptions, but not for any serios reading, like Les Miserable for instance. The iPad is all about entertainment rather than any real usefulness. It's a completely frivolous item that I'd only buy if I had about 1k bucks to waste, and I don't, nor do I see myself having money to waste any time in the near future. I'd rather buy items that will more appropriately fit the need I have for them. "....The iPad is all about entertainment rather than any real usefulness...."